Da Capo Press, 9781560254980, 364pp. Wise Guys takes readers into the heart of Sopranos territory, with a collection featuring the work of best-selling writers from E. L. Doctorow (with an account of mobster Dutch Schultz that includes one of the great execution scenes in the literature of the Mob) to Nicholas Pileggi (on Henry Hill's first prison term, overflowing with good pasta and booze). 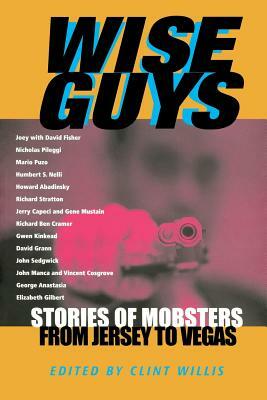 Other pieces include Jerry Capeci and Gene Mustain reconstruction of the vicious hit on "Big Paulie" Castellano outside of Spark's Steakhouse (which catapulted John Gotti to leadership of the Gambino family), Mario Puzo's riveting account of a don's ascent (a tale of deceit, murder and, above all, cunning), and Norman Lewis on where it all began: the Sicilian Mafia's battle against Mussolini and its return to greater strength than ever. CLINT WILLIS is the series editor of Adrenaline Books. His anthologies for the series include Epic: Stories of Survival from the World's Highest Peaks, Mob: Stories of Death and Betrayal from Organized Crime, and Gangs: Stories of Life and Death from the Street. He is also the series editor of Adrenaline Classics, which includes such hit titles as Joey the Hitman. He lives in Maine.